The multiple Geld wie Heu (lit. money like hay) is created around the change of currency from mark to euro in 2001/2002. There are four copies. This saying, 'got money like hay meaning have a lot of money, becomes reality in a 18,5cm x 13,5cm x 8cm large wooden Frame. 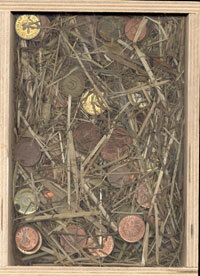 The coins used are Pfennige of the old currency and so after the change of currency as worth as much as hay. In the same series belong The needle in the haystack and Original and copy.